Home / Editor's Choice, Entertainment News, Featured Articles, Gossip and Drama, News, Politics, Videos / YUCK! See what YOWERI MUSEVENI was caught on camera doing in public, this old man is an embarrassment (VIDEO). YUCK! See what YOWERI MUSEVENI was caught on camera doing in public, this old man is an embarrassment (VIDEO). Monday, September 10, 2018 - Ugandan President Yoweri Museveni should behave and have some manners. 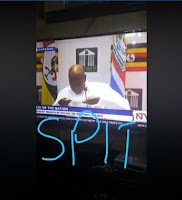 In this video, he is seen spitting kikohozi in a public function. It’s so shameful to see a President do this. Kwendeni huko kwani mnafikiria 'Himselfu' yeye uwa ni post kavu? Ata kunyamba ananyamba wacha kukohoha!